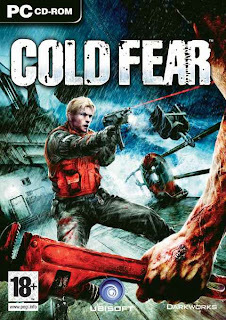 Cold Fear renews the horror genre by combining the popular elements of both action and horror releases, delivering an action-packed, fear-filled gaming experience.Players step into the role of Tom Hansen, a U.S. Coast Guard who is sent to board a drifting Russian whaling ship in the middle of a howling storm on the Bering Sea. He arrives only to discover that terrifying surprises await him on the bloodstained decks of the constantly rocking, shifting vessel. Set in a volatile, dynamic environment, players will find themselves overwhelmed by fear as they engage in intense combat with intelligent enemies. Even the toughest competitor will be challenged to endure the heart-stopping terror that is Cold Fear. Windows 2000/XP only 1 GHz processor minimum, (2 GHz recommended) 256 MB RAM minimum, (512 MB recommended) 2.2 GB hard-drive space DirectX 9-compliant 64 MB (128 MB recommended) see supported list* DirectX 9-compliant sound card DirectX 9 included on disk 8x DVD-ROM drive or better Mouse, keyboard, Windows-compliant game pad Supported video cards at time of release: Nvidia GeForce 3/4/FX/6 series (GeForce 4 MX not supported) ATI Radeon 8500/9000/X series.